One of my favorite blogs is Sojourner's Place. The vibe and flow from that blog is uplifting in every sense of the word. As such, it filled me with joy to learn that Sojourner honored this blog with her 'Helping Hand' award. Later I was honored by A Slant Truth and Regina's Family Seasons with this same award. Sojourner commits her life to "leaving the pile higher than (she) found it". She seeks to "pay that help and support forward" to those new to the blogsphere. As such, she created the "Emblem of the Helping Hand" as a token of her appreciation for blog mentors and a source of encouragement for those who are up and coming. Select 10 bloggers: 5 you consider your blogging Helping Hand then "Pay it Forward" by extending your "Helping Hand" to 5 additional bloggers in support and encouragement for their efforts. In passing on the Emblem, each recipient must provide the name of blog or blog author with a link for others to visit. Each recipient must show the Emblem and put the name and link to the blog that has given it to her or him. Link the Emblem to this post: Helping Hand: Much Obliged and Paying it Forward so that others will know it origin and impetus. If you have not already done so, show your recipients some love by adding them to your blog roll, Technorati Favorite list, or in any other way to further let them know that their blog voice is important to you and being heard. Add your name to The Helping Hand meme at my new blog entitled The Emblem of the Helping Hand and don't forget to leave a comment as a permanent record of all Helping Hand recipients. To my Blogging Mentors, please accept this "Emblem of the Helping Hand" as a symbol of just how much your help, support, and encouragement has meant to me during the past 6 months. African American Political Pundit - I came close to resigning my membership in The AfroSpear a few months ago. AAPP stepped up with a phone call and other support to work things out in such a manner that I could remain with this progressive group of bloggers. I appreciate his helping hand very much! Blacks Gone Geek - I have worked with Milt Haynes for a number of years in BDPA. In fac t, I served as national president-elect of that crew during the two years (2002-2003) in which Milt was national president. Milt urged me to get engaged in Web 2.0 world for many months before I finally did so. I am glad to publically acknowledge the helping hand that Milt has provided to me over the years. 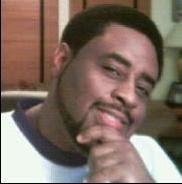 Dallas South Blog - Shawn Williams is a brother who quietly and effectively takes care of business through his blog. He attended the Jena 6 protest march last year. He served as a credentialed blogger at the Democratic National Convention earlier this year. He worked behind the scenes on Urban Policy issues for the Obama campaign. Over the past few weeks he has promoted his blog with a weekly Constant Contact message. I plan to follow in his footsteps over the coming weeks. It is for these reasons that I acknowledge the helping hand of this powerful blogger. plezWorld - Plez is an AfroSpear colleague. Many people talk the talk ... but Plez is a brother that walks the walk. He stepped up as a volunteer for a thankless tas k. This award is my way of saying, 'Thanks'! Ultraviolet Underground - PurpleZoe opened up my eyes and heart to the impact of human rights abuse in Darfur, Tibet and elsewhere. More to the point, she created a forum, Roots of Humanity, and a monthly blogging campaign, Am I Not Human?, to bring awareness of human rights issues to our blog readers. She is a sister with a powerful aura and I appreciate her cyber-glow. I'm "Paying it Forward" to the following blogs. These are blogs that are doing it and doing it well. Each has a very special place reserved just for them in the Electronic Village. I encourage you to visit, leave a comment, and if are so inclined give subscribe to them as well. Cause we bloggers are fragile and need your support and encouragement. Black Threads - My sister, Kyra, is the person who got me into blogging in th e first place. I want to 'pay it forward' to her because she deserves it. She is an eCommerce marketing manager, author, and quilter. She just co-wrote her third book, "Liberia: A Visit Through Books". 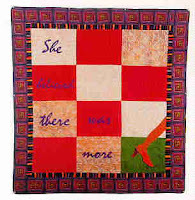 It follows on the heels of her previous books for children and quilters. She is currently collecting info on President Obama Quilts! Blogging While Brown Conference - One of my favorite blogging moments this year was being a presenter and attendee at the 1st annual Blogging While Brown conference hosted by Gina McCauley in Atlanta GA. I look forward to attending the 2nd annual BWB Conference in Chicago and I hope that many of you will be there as well. 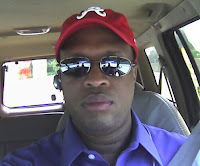 Clark Thought Leadership - Julius Clark is an up-and-coming leader in the IT industry. I've known Julius for a number of years. I always knew that the youn g brother could throw down in the hospitality suite ... I now know that he can throw down in the boardroom as well. Julius is president-elect for BDPA Charlotte chapter and I want to 'pay it forward' on the success of his brand-new blog. Keep It Trill - One of the most dynamic bloggers that I've met in recent weeks is Kit. Her writing skills and her willingness to be an activist in the afrospere inspire me. As such, I want to 'pay it forward' by supporting her in any manner possible as we move into the new year! SES: Science, Education & Society - This is a blog created by The Urban Scientist. Science is not a subject discussed very much in the Black community. This blogger is consistent in bringing good information and open dialogue about science for any person of African descent interested enough to visit. I 'pay it forward' in the hopes that more of us will find and support this great blog(ger)! Well, I hope that you take a moment to visit with the 10 blogs shown on my two lists. Each of them inspired or supported me during these past 6 months. I will close using the words of Sojourner ... MUCH OBLIGED! VERY MUCH OBLIGED! Congrats to you and the others! Big Up to you and all the work you put in on this blog. Finding this page has been one of the best things that could have happened to me this year. I also wanna thank you for allowing me to be a part of the AfroSphere. It is my intent to be a part of the machine for change. Thank you for your kind words. You have been extremely supportive of me and my family too. Your support of my daughter after her accident, naming her a village hero was particularly appreciated. It lifted her up. Villager, thank you for being you. I'm reading the named receipients and nodding my head in agreement. I did NOT expect to see my blog and name mentioned. Thanks. My "to-do list queue" is back up, too. I am honored and CONGRATS to the the other awardees. Let me get some more papers off the the publishers (I've been busy writing my primary science stuff and have gotten one paper off to a journal, still cranking it out), and I'll post the love. Villager, can you see me grinning from ear to ear? Your voice in the sphere means so much to so many of us. I am honored by the display of the Emblem, the warm and kind words you say about my spot, and your continued support of SjP's. Much obliged...very much obliged! Mike - I see that you proudly display this Emblem of the Helping Hand as well. Outstanding! RiPPa - Just keep doin' what you do! Try to remember that folks are reading what you write. Be consistent in posting. And reply to folks that leave comments. I look forward to working with you over the coming weeks and months within the AfroSpear! Urban Scientist - I truly enjoy how you are consistent in dropping knowledge about science and encouraging Black folks to get engaged. Stay strong ... and keep doin' what u do! I was just doing a Sunday sweep of my five and was not expecting to read such kind words about myself on your site. You've been an example for me since our blogs were thrown together in the Spring of aught seven. God Bless you and your fam and thanks for placing me with this wonderful group of bloggers. Shawn - You are the one doing the work. You've taken your game to the next level. The rest of us are just trying to catch up! Hmmm...who are the other four you sweep on Sundays? thanks man... i appreciate the sentiment. and although, my work with the AfroSpear was a thankless task, it turned out that it was also a labor of love... thanks again! I am so humbled. Thankyou very much for this. I will have to post this shortly ^_^. Been multitasking on this end, but I will aim to do this soon. Plez & Dazjae - Regina's Family Season was kind enough to present me with this award over the weekend. I had posted about you both in mid-December when another blogger honored me with this award. Instead of finding 10 new folks ... I reposted what I said back in mid-December. I'm glad I did as it gave you both a chance to see how much your efforts have been appreciated! Congratulations to you for this award and to all of the honorees who were selected!! Oh...by the way...when I become a grown-up blog...I want to be just like Sojourners Place!! Are Black Women the Most Affected by STDs? Wordless Wednesday: Martin Luther King, Jr.
America, Can You Say 'SENATOR' Roland Burris? Are You Ready for an Obama Presidency? Is Barack Obama a Geek?